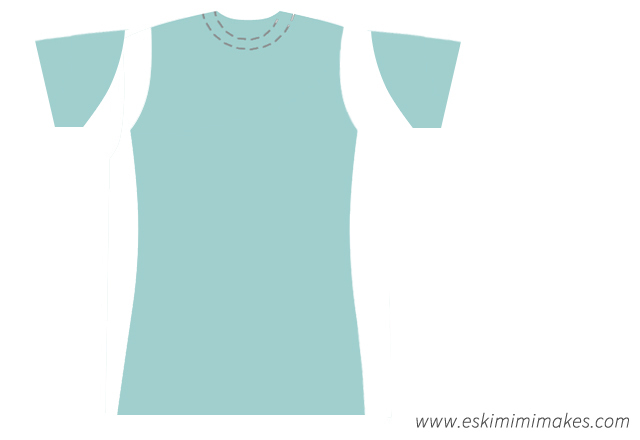 After having successfully adjusted a T-shirt to transform it from a square unfitted shape with large shoulders and seams into a fitted women’s tee, I decided to write up my method in a tutorial, so that all those cute graphic designs languishing on giant, shapeless tees need be consigned to work-wear no longer. As I wanted to keep the tutorial quite detailed to cover all steps (which also makes it a tad long), I will split it into two parts. 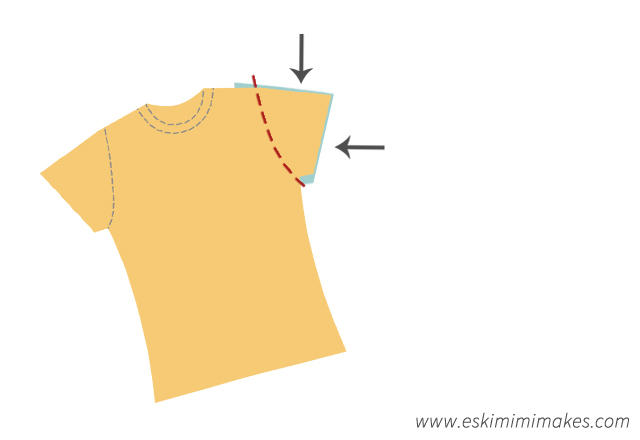 This post will focus on how to cut an old, shapeless tee to make it a fitted, more flattering shape. This will work for both mens and women’s T-shirts, where a more fitted result is desired (indeed, I have adjusted a too-large T-shirt of Mr Awesome’s to fit him better using the same method). To start, gather everything you need. 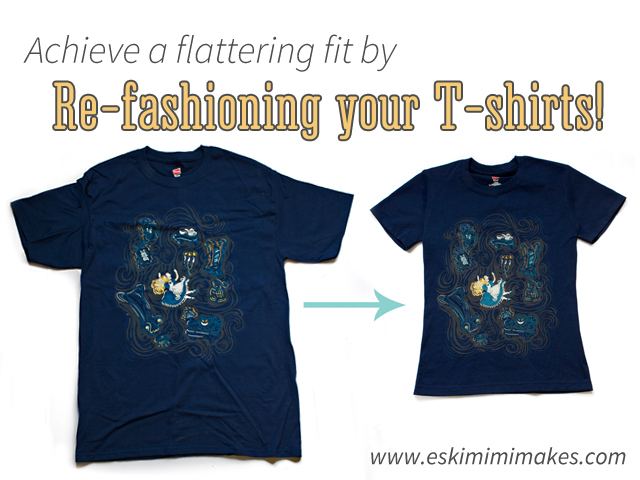 You will need the T-shirt that needs adjusting, as well as your favourite fitting t-shirt. Make sure that both are freshly laundered so that they are in their washed, un-stretched state. A quick light iron will also help to make the fabric easier to work with. Other things you’ll need include a sewing machine and normal sewing thread to match the T-shirt you are adjusting, as well as the items below. Note: The woolly nylon thread used for Part Two is not essential but if you can get hold of any I think it give an absolutely marvellous additional stretch to sewing with knits and jersey fabric. If you read around this stretchy, fuzzy thread a lot of places will tell you that it is no use for standard sewing machines, used only in overlockers. 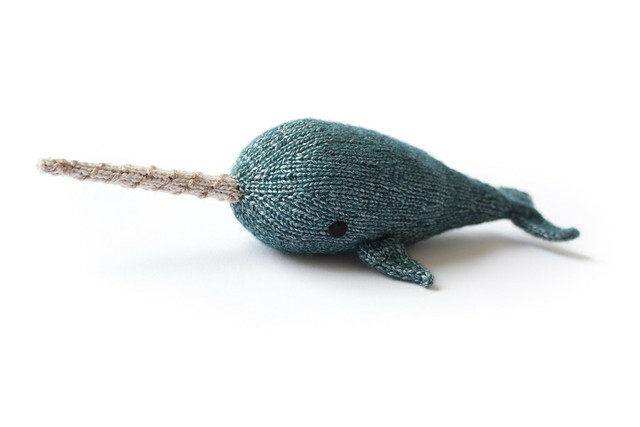 This is partly true – if you attempt to thread your machine using woolly nylon you are in for a world of frustration and pain – however, I use it only in the bobbin, and when it is consigned to that little underground spool, it weaves some magic into every stitch. If you can find any, it’s worth giving it a go. And Another Note: It’s important to use the right needles for the project at hand. Ball-point needles have a slightly rounded tip that part the knitted fibres of jersey fabric without splitting them (many knitters will know the frustrations of knitting with a ‘splitty’ yarn and sharp needle tips). The same is true of knitted fabrics such as jersey, and if you split and break the fibres you can cause a run or ladder, might like those that creep up your stockings. The distance between the twin needle points can be of your choosing, but I like a 4mm, size 80 twin ball-point needle for the best stretch and most authentic-looking t-shirt hem. 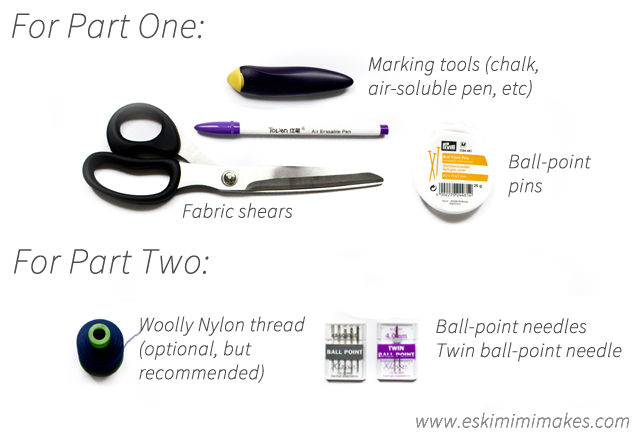 Ball-point pins are also desirable when working with knits, so as not to damage the fabric. Start by laying your shapeless T-shirt on a firm, flat surface. 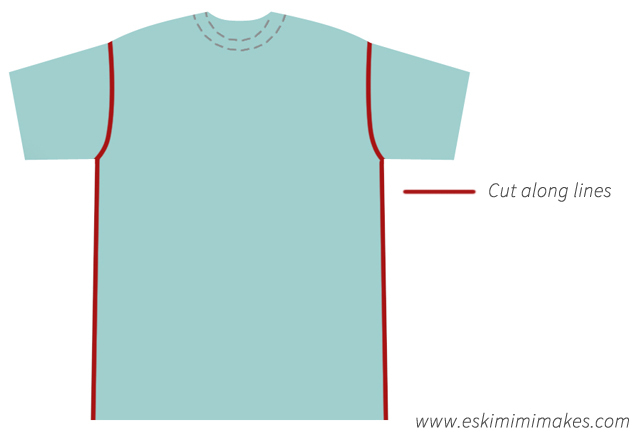 Cut along the side seams, up to the armpits (if your T-shirt is manufactured in the round, with no side seams, make sure that your T-shirt is laying perfectly flat before cutting up the sides to the armpits, in the same manner. 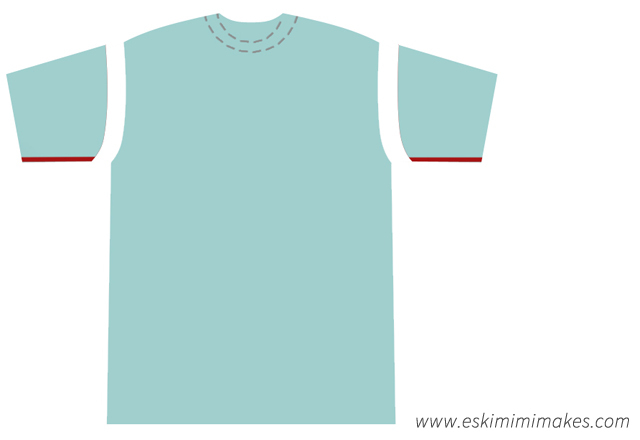 Re-align the bottom hem of the t-shirt, but ensure that your tee is now inside out (with any print on the inside. You’ll still want the front of the tee facing you, but the main tee and the sleeves should be inside out from now on, whilst you make your marks and cuts. Take your nicely fitted t-shirt (hereon referred to as the ‘yellow’ tee and lay it on top of your ill-fitting t-shirt (which will be referred to as the ‘blue’ tee). Line up the centre neck and the shoulder seams of each shirt as in the diagram above, ensuring that the distance is equal on each side. 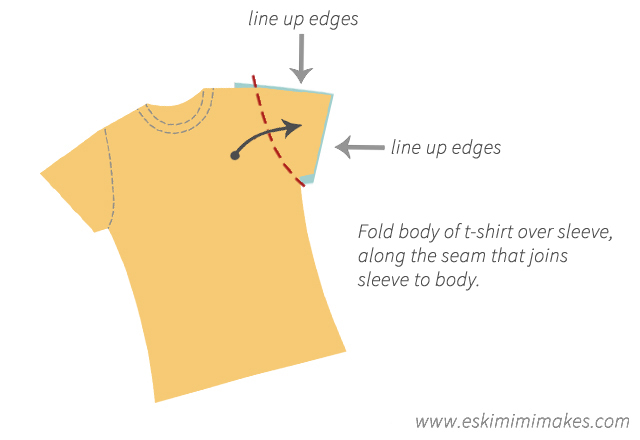 Fold one sleeve of the yellow tee along the seam that joins it to the body, following the curve. Repeat with the other side and pin in place if desired. 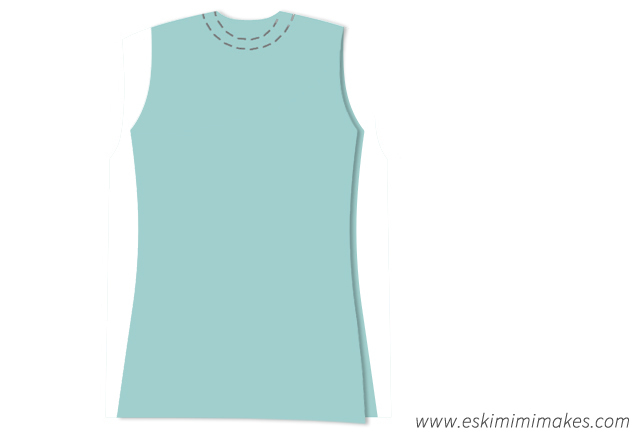 Using your chalk, air-erasable or washable pen, follow the line of the folded-over sleeve to body seam and mark a line 1.5cm (5/8″) from this seam onto the blue tee. Mark a line the same distance from the main body of the yellow tee, following any curves, and continue down to the hem of the blue tee, even if this is much longer than that of your ideal finished tee. Repeat for both left and right sides. Remove the yellow tee and make sue you are satisfied with the placement of the lines, then cut along them using your fabric shears. 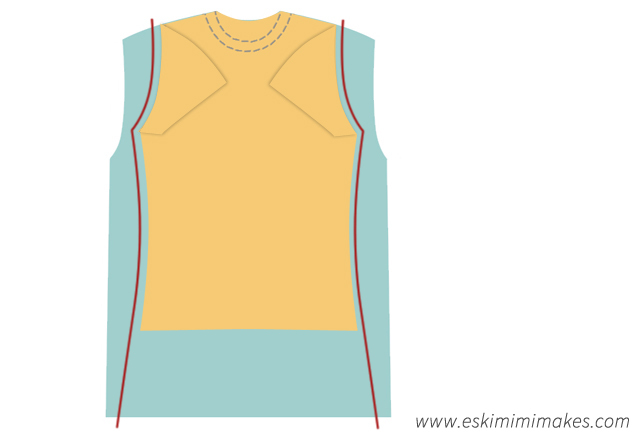 Your resulting tee body piece should now have a more streamlined shape, and you are ready to cut the sleeves. Take one sleeve and fold it inside out, making sure hemmed edge is perfectly aligned with itself. Pin if desired. 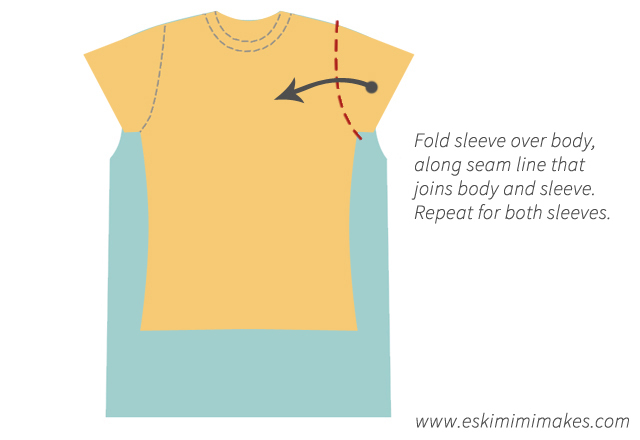 Take the yellow tee and lay it over the blue sleeve piece so that the top folded edge and outer hem both align. Pin through both this and the blue tee to hold the pieces in place. 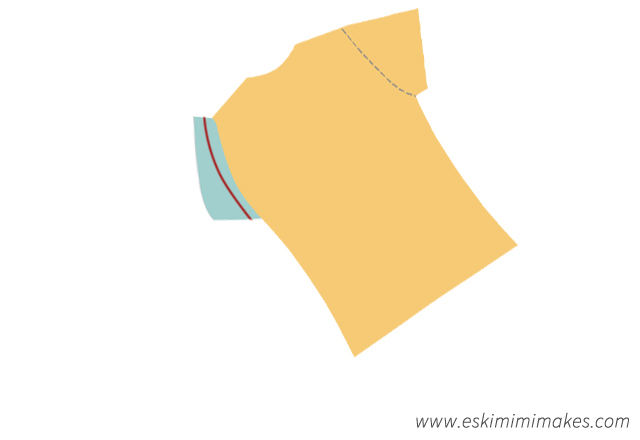 Mark a line following the underarm of the yellow tee, 1.5cm, (3/8″) from the underarm seam, to cut along. 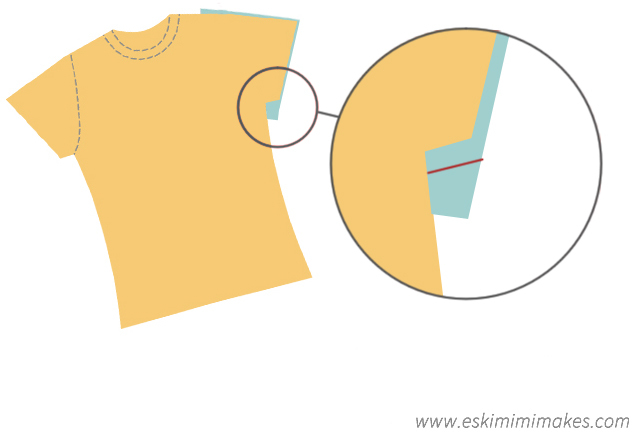 With sleeves still pinned and aligned, fold yellow tee along seam that joins arm to body, to expose the excess sleeve fabric of the blue t-shirt. 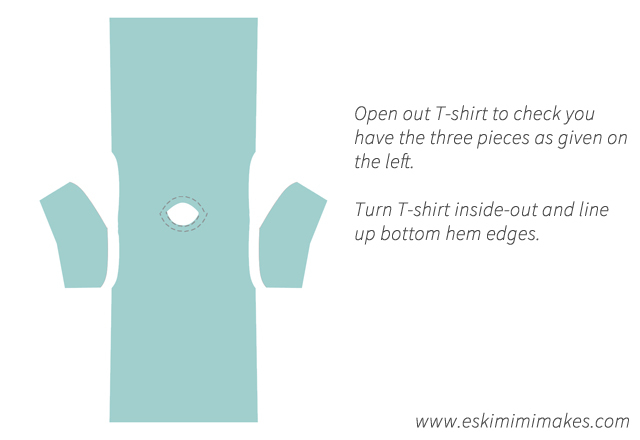 Once you have your finished sleeve shape cut out, use this as a template to cut your second sleeve, ensuring both sleeves are identical. You should now have the basic pieces for your modified T-shirt. It may still be a little longer than desired, but this will be adjusted in Part Two. Thanks for this! I see many a t-shirt re-sizing in my future!! I feel some sewing coming on. Thank you for always putting together such thorough tutorials.